Fresh Spring Waters- "Wade into cool, enchanting waters and give your laundry an incredible just-washed freshness that lasts for months." Fresh Lavender Blossom- "Wander through colorful, sun-lit fields of lavender and give your laundry an incredible just-washed freshness that lasts for months." Fresh Mountain Breeze- "Capture the exhilarating moment of a crisp, fresh breeze and give your laundry an incredible just-washed freshness that lasts for months." Purex ScentSplash is in liquid form and simple to use. Purex sent a bottle of Fresh Spring Waters for us to try. The aroma appears to be floral with a hint or possibly fresh linen? The floral aspect of the Crystals doesn't seem to be overwhelming. It is quite lovely and energizing! I cannot comment on whether or not the product freshness "lasts for months" as it has only been tested this week in our household. I can mention that our laundry still contains some of the fragrance! 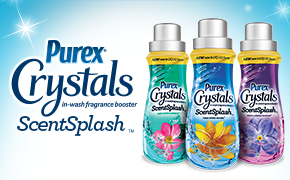 The crystals ScentSplash products pair well with the Purex detergent and dryer sheets. Purex detergent can be found nearly anywhere. Crystals and ScentSplash products are sold in several locations, but available scents vary by location. I use Purex on a regular basis, especially when it goes on sale. Consumers can generally find Purex products on sale at least once per month. Purex often includes a product coupon in national newspapers. 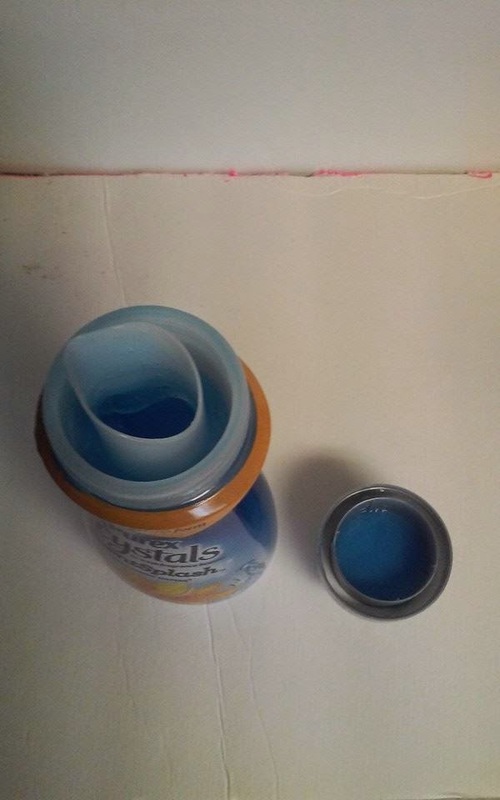 I haven't used the crystals in addition to the ScentSplash, but have used the detergent and dryer sheets. Neither of my Purex products match at this time. I plan to purchase matching detergent, dryer sheets, and solid crystals to combine for an enhanced laundry experience. 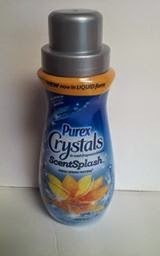 Measuring the amount of Purex crystals ScentSplash is a breeze. Simply pour your liquid to the fill line of your choice. For added freshness, I use more. I always fill mine to the top on large loads. For smaller loads, I use 1/2 a cap. After reading the back of the bottle, this product can be used in both topload and front loading machines (HE safe). It states that you can pour this product directly into the basin with your clothing or wash tray. Any excess product will drain back into the bottle when the cap is replaced. I haven't experienced any issues with damaged materials, nor have we had any issues with skin allergies while using this product. Be sure to read the ingredients before using. Those with sensitive skin or prone to allergic reactions due to fragrances may not be able to use this product. 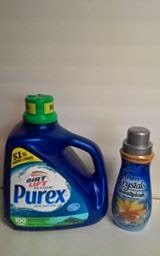 Would you like to win a coupon for a FREE bottle of Purex Crystals ScentSplash in-wash freshness booster? Enter the giveaway tool below for your chance to win. Rules: Don't worry, my rules are simple! -Giveaway ends 4/20/15 @ 11:59 pm CST. A winner will be randomly chosen via the giveaway tools widget and contacted via email. Winner will have 48 hours to respond with shipping information. If winner does not respond within 48 hours, a new winner will be chosen. I will personally ship the prize out for this giveaway. *My blog is not associated with the other blogs offering the same prize. If you win elsewhere, you will still have a chance to win here! DISCLAIMER: I received a free sample of Purex Crystals ScentSplash in exchange for this post. Alll opinions are mine and true. It is important for me to share my honest feedback on a product. Please keep in mind that all opinions may or may not differ. I like Purex dryer sheets. I'm still liking the dryer sheets. I like the purex laundry soap in mountain breeze. Purex and I are best friends. :) So, I love all their products. But, one of my favorite products is Purex PowerShot. I love using Purex Dryer Sheets. I like the Purex crystals in lavender. Want to try this version.